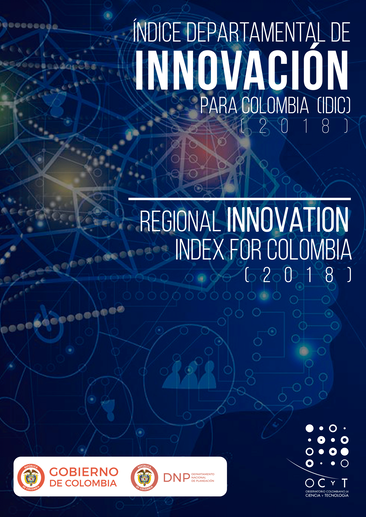 The Regional Innovation Index for Colombia, denominated as the IDIC, is a comparative evaluation of the capacities and conditions for innovation within the regions of the country. In Colombia, sub-national political regions are also referred to as departments. The IDIC aims to assess departmental asymmetries and identify strengths and opportunities across the different regions. The index is constructed by adapting to national and regional realities the methodology of the Global Innovation Index (GII). The IDIC project is financed by the Departamento Nacional de Planeación (DNP) and executed by the Colombian Observatory of Science and Technology or Observatorio Colombiano de Ciencia y Tecnología (OCyT). The latest edition of the IDIC was launched in December 2018 and the GII team had the opportunity to connect with Ms. Clara Inés Pardo Martínez, PhD the Executive Director at OCyT, to discuss the project in more detail. 1. Why was it important to create the IDIC and how was it done using the Global Innovation Index (GII)? Colombia required an instrument that measures innovation inputs and outputs at a regional level, with the possibility to be benchmarked internationally using a globally approved framework standard such as the GII. Using the results of the IDIC, Colombian regions are classified into clusters according to their innovation performance. By doing so, the IDIC is able to determine asymmetries in capacities, innovation results and socio-economic features by explaining strong relationships between innovation and competitiveness at a regional level. Using these elements, we are able to lead the development of main strategies related to design, with the possibility to apply adequate instruments to promote innovation and development in each region. The IDIC was created using the GII methodology, as described in the report and on the webpage, as a base. For the Colombian Index, 115 indicators were identified as being most appropriate for this context. As seen in figure 1 below, the Index is made up of two sub-indices (input and output), seven pillars and 21 sub-pillars. The GII provided a good foundation as the IDIC was seeking to achieve a similar structure and set of variables that allowed a comparative analysis. However, the IDIC uses different descriptive and segmentation algorithms, designed by the Colombian Observatory of Science and Technology (OCyT). These algorithms are used to calculate and analyze variables, sub-pillars and pillars and assess several statistical tests that were applied as sensibility analysis. Contribute to the homogenization and standardization of information generated by national and international entities, and producers of primary information in the fields of scientific and technological research, which allow for better collection of information and innovation metrics. 2. Describe the experience of creating the IDIC and the challenges you may have faced for collecting innovation data at a sub-national level – in particular in a developing country setting. Those regions that are most isolated in the country under-report information, which limits the inclusion of these regions in the report. However, with the information that is available, it has been possible to impute these data. This process has allowed for the successful inclusion of 31 out of the 32 Colombian regions as well as investigate primary sources that could provide more accurate innovation metrics. Moreover, it has been important to conduct this analysis with the available data in order to determine the most accurate approximation of innovation index, while taking into account the GII methodology. This project allowed the OCyT to define statistical techniques and algorithms to capture and process information with higher quality, and obtain robust, accurate data for each region. Moreover, the regions are encouraged to improve their data and information gaps to warrant their inclusion in the IDIC. In doing so, they are in a position to measure their innovation performance and develop strategies to strengthen innovation policies and instruments according to these results. The project also developed a web application called: “Build your own IDIC”, which allows regions to tailor the indicators so that they can analyze improvement and identify potential opportunities to intervene by introducing better public policy from the root cause, based on evidence. 3. What has the outcome been of the IDIC and what are the plans for the future? 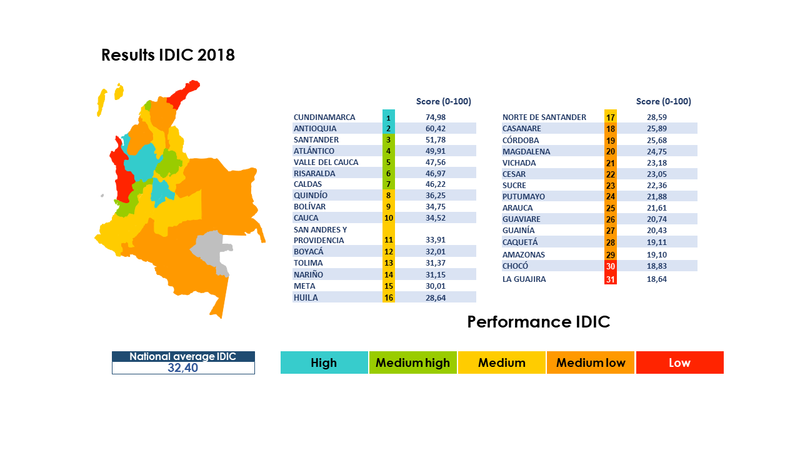 Our findings of the last IDIC version indicated that 22 out of 25 departments improved their score and position except three departments Caquetá, Norte de Santander and Casanare. Overall, improvements in the pillar scores for infrastructure and creative production, and drops in scores for the pillars institutions and human capital and research were identified. The IDIC continues to demonstrate that there is great heterogeneity in the environment for innovation in the Colombian regions. Therefore, the development of regional systems of innovation relies on strategies that include the systemic vision and its complexity. In this context, it is important to promote cooperation and knowledge transfer that allows the appropriation of good practices between regions. The IDIC is a public policy tool used by Departamento Nacional de Planeación (DNP). The DPN has introduced this tool in the various regions as an input for decisions, programs and public policy projects. For the future the OCyT hopes to have more precise data, with a clearer review and analysis of the Oslo Manual (2018) as well as the application thereof and an update in concepts and variables. Additionally, the OCyT wants to ensure that each department has its own innovation policy that support the national innovation policy/agenda, thus improving the index, with the end goal of making Colombia a more innovative country. It is important to continue applying statistical quality guidelines to create a robust, suitable and reliable index, which (1) guarantees replicability of data, (2) achieves a higher appropriation of IDIC in the Colombian regions as an input that is key to developing innovation policy and (3) measures the improvements in innovation at the regional level. These will aid in determining the adequate allocation of resources and projects. All of this will allow innovation to strengthen as a pillar of sustainable development in Colombia. Finally, the OCyT believes it is important to disseminate and transfer their knowledge of this experience to other countries that are interested in applying these methods to analyze regional innovation based on the GII.